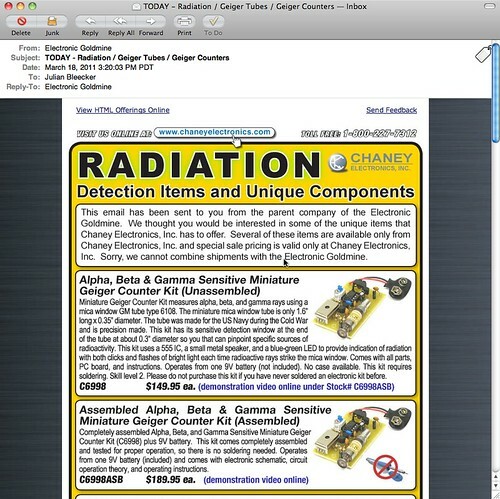 Completely understandable how the recent tragic events in Japan would translate into email from an electronics source containing *only parts and supplies and modules to make Geiger Counters. At the same time as it’s understandable, it’s one of those things that feels like it’s taking advantage of the general panic, confusion, sadness and apocalyptic angst. Not deflecting the urgency and anxiety of recent events in Japan, it’s curious to me to think about how and when change is able to happen. By that I mean that things happen, swerve off-course or are able to swerve off of into unexpected, new directions. For example, the events after 9/11 where an *opportunity space opened up in which dramatic, unprecedented changes were able to be made in the legal systems of some countries. Things that would not have been so easy to implement had their been no epic tragedy. Similarly, in a way — now we learn quite a bit about nuclear physics, science, speculation about the malfeasance (if you can call it that) of this nuclear quasi-agency in Japan (via @xenijardin WSJ: TEPCO initially resisted using seawater to cool reactors; harm to “valuable power assets” feared ). We find ourselves preparing — again — for an earthquake, nuclear catastrophe, flood, Tsunami, etc. Entirely enormous nations are scaling back and turning off nuclear power plants (I find this most intriguing) and rethinking their energy policies. I mean — that’s epic. Whatever side you may be on the issue of nuclear power, these events, at the cost of untold lives, future lives, physical infrastructure, and so on — everything has been changed. The imagined course into which the future was going to be made, has swerved. We often like to think of change coming about from good, thoughtful, happy actions and activities. Like good design work, for example. I think, from my experience, it is often never like this. It is hard. Change is hard. Making things better is hard. Generally, and anecdotally from the experience of myself and others up and down the hall here on the 7th floor of the Laboratory — people are reluctant to change their ways, the course of their lives. Moving out of “comfort zones” and all that is, well — uncomfortable. Adapting and adopting new ways of living, behaving, thinking would make for a more resilient world, I think. One that was not afraid of difference, of giving things up for the hope and possibility of a better things. Of course — it can all go wrong. But at least we’d try. Parenthetically, Studio 360 has an intriguing related radio story on this topic. It is called Japan: The Imagination of Disaster. Why do I blog this? As always, we here are quite intrigued by how the future comes to be — what are the mechanics, semantics and motivations that move people to obtain and create possible futures. In this case, “taking advangage” of opportunites when one can do that bit of swerving, rudder-pushing, tiller cranking because the currents become favorable to try a new tack. Spent a very cool conversational show-and-tell-y bit of time with dividual’s Dominick Chen and Takumi Endo at their new cozy studio digs. I guess Paul connected us last minute, which is basically how this whole trip has been, which is fine. Dominick and Takumi have been working quite a bit with the semantics of time in digital interactions. 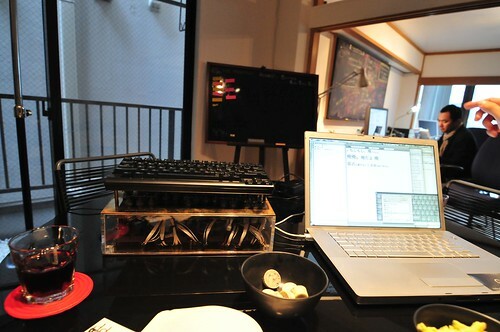 They created this project called TypeTrace. 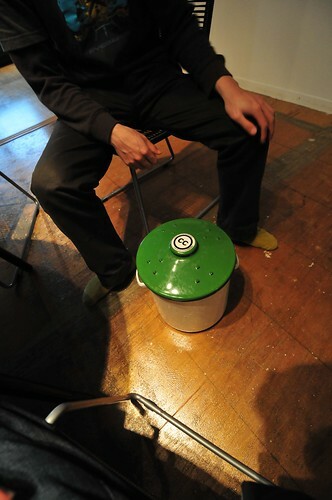 It’s a mechanism for exploring the relationship between physical interactions in digital contexts. 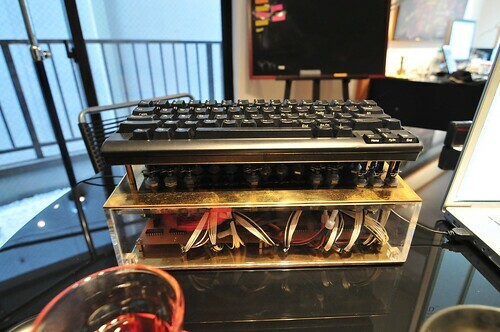 A keyboard is used to record the composition of words — letters or books, in one case. The recording captures all subtleties of working at a keyboard, which can then be played back with the keyboard acting as a kind of player piano. The keys are literally articulated from underneath, giving the appearance of a ghost writing the composition. If a key is held done a bit longer than others, you see that (and hear it.) The letters and words are played back on screen, changing their typography depending on how long the composer has lingered over certain passages. Letters and words will grow in size if a key is held down a bit longer than others, suggesting that the composer has lingered over a word, and insinuating, perhaps, that their thoughts mulled over the meaning at that point of the composition. Our conversation about “slow” things and the meaning of time in a digital age, compelled Dominick to slip into the studio kitchen and bring out their fermentation vat — another slow process. 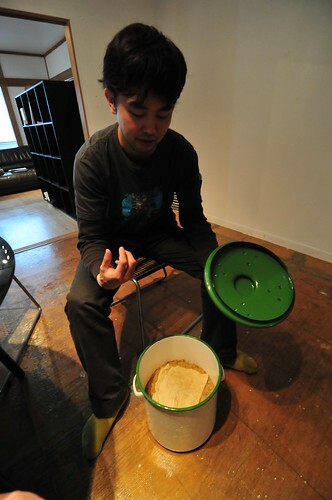 In the digitally networked milieu, fermentation gets a creative commons mark! Chen studied at UCLA’s DMA. The TypeTrace project started out as an interactive art project, exhibiting in various museum and gallery contexts. It had some good success. 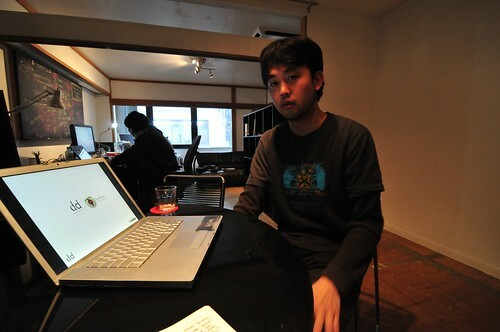 Chen went on to begin studies in an interdisciplinary Ph.D. program in Tokyo, and left that recently to pursue TypeTrace. His interest, shared I believe by many smart, aspirational autodidactic thinker/maker/researcher/theory people is to find ways to circulate his ideas outside of the usual art contexts, and beyond the confines of academia, where “makers” are relegated to engineering disciplines. Like many others, he finds the “interdisciplinary” approach to art-technology-design works best in cocktail party conversations than it does when academia tries it in actual practice.